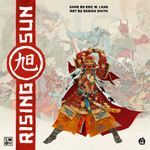 Sweeteners: Rising Sun: Monster Pack and Rising Sun: Dynasty Invasion. Does NOT include metal coins or playmat. Daimyo box has a small hole (sustained before delivery) on the front.